Dice is a squire type solid box which contains 6 different numbers on all of its sides. We throw dice on a surface to get a random number while playing the games. In this lesson, we will build a dice that is shaken by holding the button in and thrown by releasing the button. The shake, throw and number thrown are animated and displayed on a seven segment display. A 74HC595 IC is used to interface the 7-segment display to the Arduino, using only 3 Arduino digital pins. Find more information about interfacing the 74HC595 IC to the Arduino in the Arduino Lesson – 74HC595 article from the Osoyoo website. The circuit diagram uses the same Arduino pins as this article. 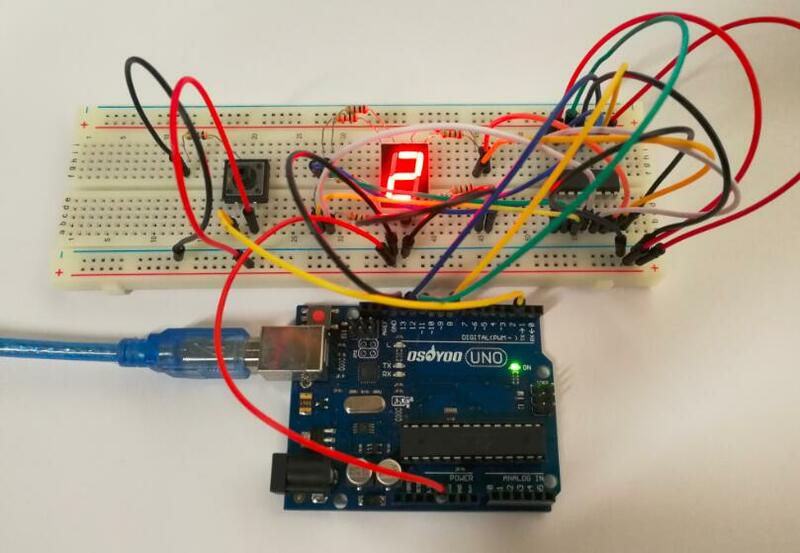 If you want to get more info about the switch button please check the Arduino Button example, more info about the one digit 7-segment LED display please check the Arduino Lesson – one digit 7-segment LED display. The circuit diagram is shown below. The seven segment display could have been directly interfaced to the Arduino, but by using the 74HC595, only 3 Arduino pins are used. A few seconds after the upload finishes, you should now see the 7-segment display jump between numbers from 1 to 6. Press the button, and the jumping will slow down until it stops three seconds later. Press the button again, and the process will repeat.